How can you use the power of Mother Nature in a pleasant way to combat all kinds of disorders? When the founders of Medihemp wanted to be less dependent on modern chemical medicines, the Austrian family business searched for a versatile, natural product that gives the answer to that question. The natural power of hemp has been known for some time. Medihemp became known by combining hemp and daily health products. And so, between the characteristic Austrian (Burgenland) grape vines, the first 15 hectares were planted with hemp. Due to the unforeseen success of these powerful products, a lot has happened over the years. Medihemp saw the introduction of the CBD capsules and CBG oil. Meanwhile, the hemp fields have grown to more than 400 hectares and the end of the growth is not yet in sight. Sustainability is of paramount importance at Medihemp. For example, the family business uses its own harvest in more ways than you might think. The organic hemp seed oil where the CBD extract is dissolved, Medihemp makes themselves with much love. Even the insulation material of the building where Medihemp is located is made from hemp from the own harvest. A biological standard is not just anything. To begin with, regular inspections are held. Organic and non-organic products are also separated in the entire process. 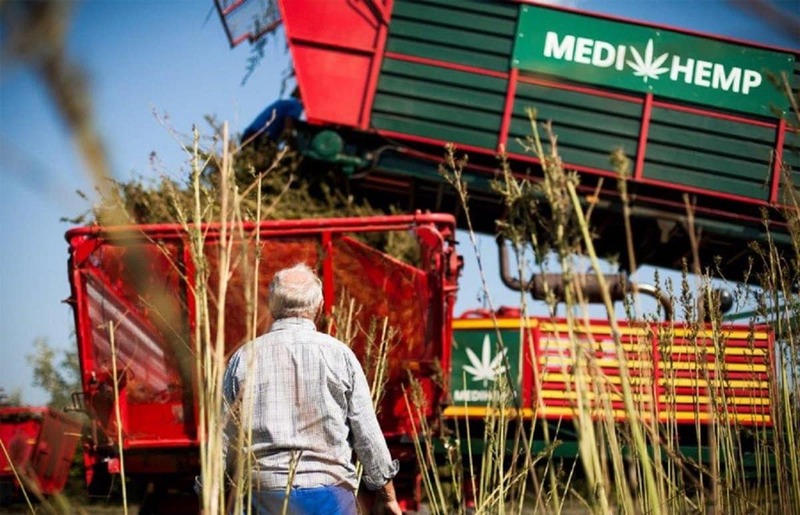 Medihemp goes even further by using special harvesters only for the biological fields and only using extraction machines for the organic plant material. Machines are first thoroughly cleaned before they are used and the biological end product is stored separately. In the cultivation and harvest of Medihemp’s fiber hemp, chemicals such as artificial fertilizer, pesticides, antibiotics or artificial additives are never used. The products are not genetically modified and gamma radiation is also avoided. Medihemp is known for strict monitoring of clean agricultural land. For example, the soil must have been free of chemicals for at least 3 years, which Medihemp uses for hemp cultivation. The process is closely monitored and starts from the hemp seed. For example, a large number of laboratory tests are carried out during the growth and the acquisition of the oil. Medihemp also has various independent laboratories carry out tests to check whether the measured values match. This way you are assured of the best quality CBD oil products. Not only the final product is tested. In the entire process, from seed to end product, there are test moments for control. The seeds are already tested for CBD / CBDa and THC / THCa levels, heavy metals, pesticides, aflatoxins, and microbiological contaminants. In addition, the moisture content, the density, the amount of free fatty acids and non-soluble impurities in the seeds are determined. The acidity level (PH) and the peroxide content are also measured. During the growth of the hemp plants, the CBD / CBDa and THC / THCa values are again measured. And just before the harvest, the test is done again to determine the percentages of cannabinoids in plants. Subsequently, the dried plant material is again extensively tested on all the aforementioned objects. And then again after extraction of the CBD and one last time when the product is ready to be bottled. Since Medihemp produces organic products, the taste, color and substance will differ per batch. This is due to the conditions in which the plants grow. Think of sun, precipitation, temperature, type of plant, composition of the soil, etc. But it is also a signal that Medihemp does not add any chemicals or other substances to adjust the pure CBD extract. The plants produce different amounts of substances, depending on the natural conditions. Thus, each time the plants contain a slightly different ratio of cannabinoids, terpenes and more. CBD products from Medihemp are real natural products. The CBD content is strictly monitored; from hemp seed to finished product. The Medihemp CBD Oil Raw now has a new formula that increases bioavailability. This means that the cannabinoids can be better absorbed by the body. In addition, Medihemp has found a way to extract the wax from the extract. It explains why the CBD Oil Raw is lighter in color and less viscous than before. Not only the products, but also the process of making the oil meets high standards. All Medihemp products are certified organic and meet strict requirements. Sales, production and export are carried out according to: Austria Bio Garantie GmbH, AT BIO-301, FN 78753p, 2202 Enzersfeld Austria. Conducting organic certification ensures that Medihemp is distinctive in the field of selling CBD products. Medihemp is SKAL certified. This independent organization strictly controls used raw materials and production methods to guarantee the ‘organic’ quality mark. At the time of writing, Medihemp has just moved to a hypermodern and much larger location. This includes the IFS Food and ICCI quality standards directly. The IFS Food Standard is a GFSI (Global Food Safety Initiative) recognized standard for the control of food manufacturers. The focus is mainly on food safety and the quality of the processes and products. You may have your bottle of CBD oil at your fingertips and you now know what’s involved in making this beautiful product; from hemp seed to finished product.